The program airs weekly on KUSP 88.9 FM and streams live on kusp.org, from 12 - 2 a. m. Mondays (formerly Wednesdays; then Mondays 2 - 5 a.m.). 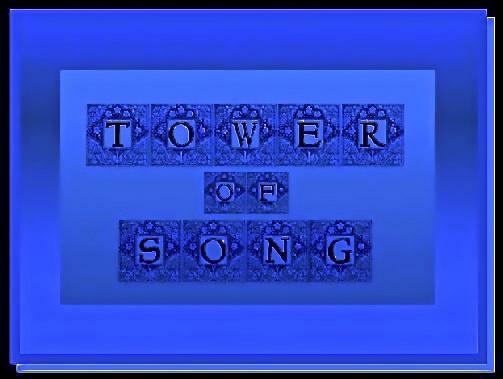 This Tower of Song website is designed as a kind of cyberspace Imaginarium and Illuminated Manuscript. And since the Gypsy Scholar designed this webpage in cyberspace to be an integral part of the radio program—synergistic with it—, he would suggest that this ToS website, with its animated images, could be described as (to borrow a technical term from early animated features on the silver screen and TV) "Illustrated Radio" (in the sense of the concept behind the program—Re-Vision Radio). 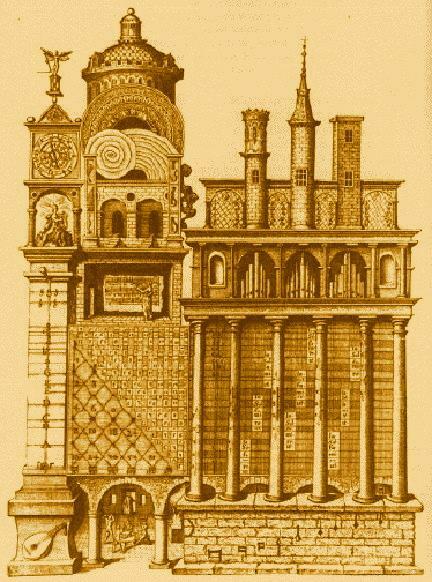 Known to the Renaissance occultists as �The Temple of Music,� it was written that: �No other invention, ancient or modern, is more seemly for consorts nor more desirable for symphonies, nor more admirable to the ears of listeners. Time destroys not the sweetness of its sounds, neither do fickle inventions seduce men�s affections from it, however rare, unusual, or more easily learnt these may be.� This �pagan mystery� of the Renaissance was a magical device whereby the Magus, using hermetic/kabbalistic interpretation, contemplated the harmonic relationships (of which the musical was itself a metaphor) and entered the Temple of Music in order to �hear Apollo�s lyre, i.e. 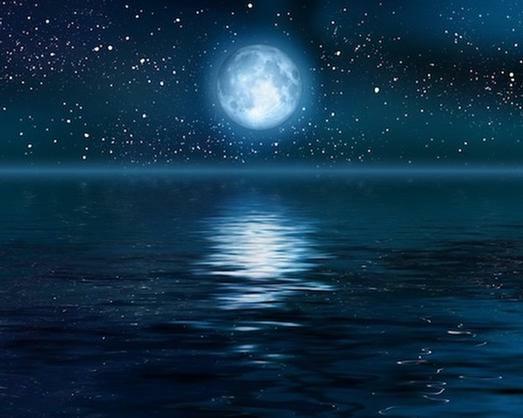 experience the celestial worlds� in a scaled flight of soul through the cosmos. Pythagoras can be seen through the main archway on the bottom floor, entering through a door. Directly above, in the alcove beneath the twin portals representing ears, a Muse stands pointing at a musical phrase in three parts. Above and to the left, the god of music and father of the Muses, Apollo, plays his lyre in the archway below the clock. 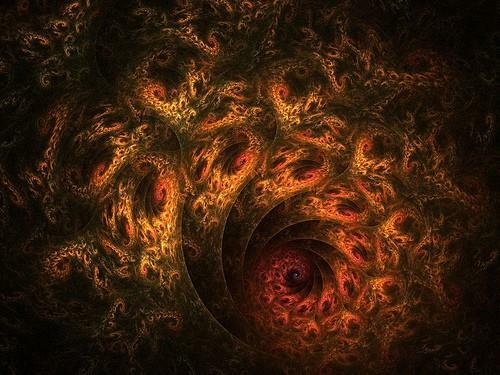 Today, we may be witnessing the revival of Pythagorean musical mathematics and its Renaissance towering music magic by way of the music generated by the fractal chaos mathematics. 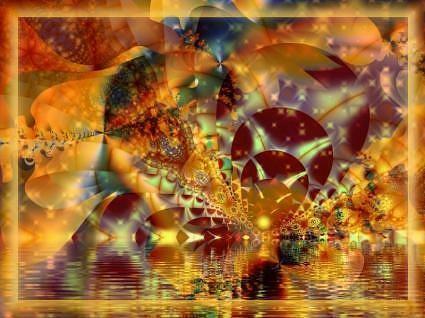 If you can't sleep and are searching "in the middle of the night" for the Tower of Song, it's one of those in-between places that cultural anthropologists call "liminal," or "threshold," zones�in between sleeping and waking, night and day (at the midnight witching hour), inside and outside�that are located at the crossroads of dreaming and reality, where the laws of time and space and causality (instead, synchronicity) are attenuated. The Tower of Song is that imaginal place other than the one of our daytime routine�"a somewhere else, where we also long to belong and need to go to from time to time." Thus everybody knows that "we are reminded of this place by a song we hear on the radio� and that we can even go there through the gateway of song to the "Invisible Landscape" of the Tower of Song. The noetic EVERYBODY KNOWS segment alternates with the mythopoetic TOWER OF SONG segment--an eclectic mixing of music and spoken-word readings from a variety of texts. It's hosted by -----------, with flower in one hand (or name) and sword in the other. Thus, Everybody Knows, it's "flower-power" radio—with the philosophic power of Blakean "Staminal Virtue." It is, then, RE-VISION RADIO: a "Soul-making" Philosophical & Literary inter-view program that re-views—looks once again in-depth at—ideas, books, issues people in the news religion and politics movements and movies. RE-VISION RADIO is, as Everybody Knows, not for everyone but for "Romantic Outsiders" only (like its counterpart, the 1960s "Magic Theater" of the Imagination—"for madmen only"). So this was the "Everybody Knows/Tower of Song" program, with its unique mix of talk (dialogue/interviews with phone-calls from listeners) and essays put to popular music—high philosophy & deep song. Little did I know then that around the same time a film by a well-known director had come out, telling the story of a popular and controversial radio host. Viewing it later on video, I couldn't help but feel that the coincidence of the host's name with mine was too uncanny! But this weird coincidence was shortly to be matched by another. Significantly enough, not long after I began my "underground" style of radio out of a station in a converted garage, I received another uncanny tribute to my novel radio conception when the 1990 film, Pump Up the Volume, hit the theaters. It opened with the protagonist starting a pirate radio program in his "basement." And his theme-song? You guessed it—"Everybody Knows"! So I know just what I am. "The truth of things can only be expressed aesthetically—in story, pictures, film, dance, and music. Only when ideas are poetic do they reach the depths and express the reality." 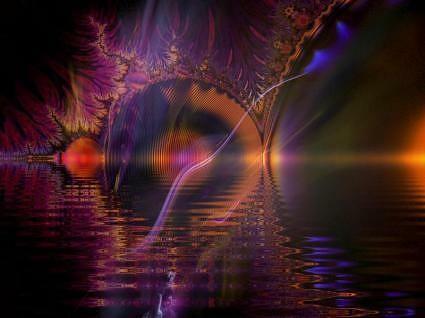 To the Gypsy Scholar, "The Life of the Mind" means the Imagination and the Inner/Interior Life. As a Philosophical program, it's about Ideas. As a Musical program, it's about Music as Idea (and, conversely, the Idea of Music). Thus the TOWER OF SONG program is finally about a Musekal Philosophy—"Philosophy in a New Key." And Everybody Knows that the Ideas broadcast from the TOWER OF SONG are not just the usual abstract kind of ideas; they are poetical ideas (not abstract, but "poetic thinking"). And, when channeled through the Orphic Essay-with-Soundtrack, they are also musical ideas, ideas which issue not in a discursive but a lyrical knowledge. Therefore, in the TOWER OF SONG the "Life of the Mind" is actually the life of the imaginal mind, or what the Romantics called "Imagination." 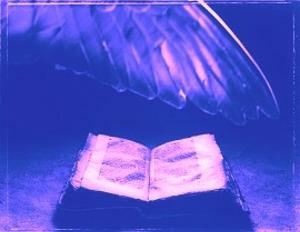 And the imaginal mind makes the TOWER OF SONG a "Soul-making" program. 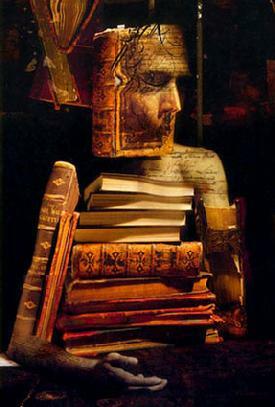 The "history of a man's dreams is not inconceivable," because the Gypsy Scholar, in "his traffic with night and with dawn,” has imagined not only the pyramids but, most importantly, the TOWER OF SONG. The Tower of Song program deals in Ideas—the ideas in music and the music in ideas. RE-VISION RADIO is a Philosophical and Musical program broadcast from an imaginal window at 88.9 on your radio dial from the TOWER OF SONG. It’s hosted by the Gypsy Scholar and Bohemian Essayist, with a flower in one hand (or name) and a sword in the other. RE-VISION RADIO is a “Soul-making” program, because it’s essentially an “underworld perspective”—a seeing below surface appearances to the occult or symbolic truth of things. Thus, Everybody Knows, RE-VISION RADIO is truly Underground Radio.... RE-VISION RADIO’s musical inter-textuality, because it reads metaphorically between the lines of Philosophy & Song, becomes the imaginal hyper-textuality of a Soul-text. see p. 2, "Magdalene Memorial-Musekal Library". After many years since the Re-Vision Radio program was last on the air—"too long in exile / too long not singing my song / too long in exile"—, this website at last allows folks to virtually "SEE WHAT I MEAN." 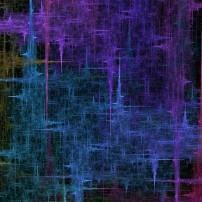 (Through a kind of Cyber "Illuminated Manuscript." See p. #11) Thus, Re-Vision Radio seamlessly mixing Philosophy & Song (dialectics/argument and music, logos and mythos), would invite, by Orpheus’ magical allure, today’s non-aligned, outsider-mystics, "to hear," like the mystics of old, "Apollo’s lyre, i.e. experience the celestial worlds." 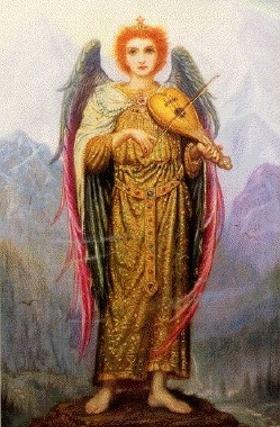 It is this musekal kind of Orphean/Dionysian gnosis that the Re-Vision Radio program strives to attain, with the aid of its bards or troubadours—the "Singers and Keepers of the Dream"—and all the great "singing masters of my soul" (Yeats): "Soul-music"—from the Bacchae to the Grateful Dead; from Orpheus to Van Morrison and Leonard Cohen. 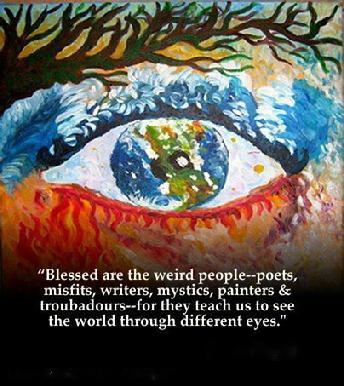 This is the basis of my "Musekal Philosophy," a musical sense of philosophy. Thus, philosophical texts or essays on Re-Vision Radio are presented in an elevated, or rhapsodic, discourse ("Reason in her most exalted mood"-Wordsworth), and thus aspire to the condition of music or song; that is, to the condition of music translated into words—a soul-text. 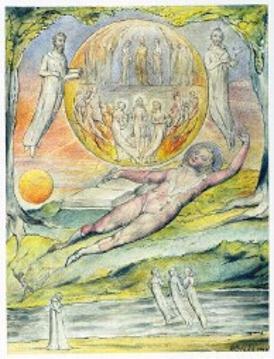 And Everybody Knows that Re-Vision Radio—mixing Argument & Song in its Orphic Essay - with - Soundtrack—is a program dedicated to Orpheus, re-visioning the role of Orphic Scholarship for radio: scholarship-as-performance art (Blake's "Mental Studies & Performances"). 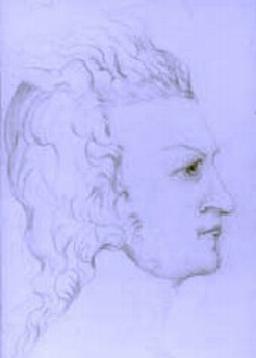 "The ability to put complex [philosophical] ideas into lyrics [of song] is the gift of Orpheus." Therefore, if you’re like me—"too long in exile" and back on the "mystic avenue," even though "it’s a hard road, / a hard road, daddy-o! "—, and you’re singing "I’m knockin’ with my heart," then you’ll be glad to know that this ancient, esoteric "Temple of Music" has now been transformed—through the Orphic magic of Re-Vision Radio—to the resonating figure of speech you can virtually walk into: the TOWER OF SONG. "If you know that a life of supreme beauty is possible how can you help but want to enter it?" She opened up the gate. She lit your fiery vision bright. 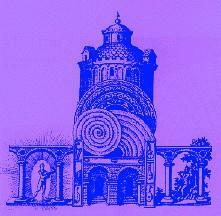 The purpose of Re-Vision Radio and its cyberspace website is to aid those post-religious, anarchist/mystic seekers on their own nocturnal vision-quests; that is, to help guide its "guests" to find and enter into that "invisible landscape" in order to discover the magic door (le porte magique) that opens out into the TOWER OF SONG,"where the poetic champions compose", and where all mystic hallways (syn-aesthetically lined with intricate tapestries of spoken-word and song) lead to Soul-making connexions--an imaginal soulscape where all meanings, through the magic synergy of effects (ideas+music+images), are finally and wonderfully visible�so you see what they mean! And, if the Orphic deep-song is really "heard"�by entering into its unfolding�, then the radio "guests" might completely enter the TOWER OF SONG and see what it means. 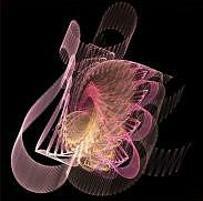 Re-Vision Radio's Orphic Essay-with-Soundtrack creates an imaginal space where Argument & Song interface�a kind of (Neptunian) radio clearing, where its listeners can virtually enter to find "nothing but a song." The Orphic Essay -with - Soundtrack (haunted by song) is designed to "leave your senses reeling." Thus, when you finally "try the handle" and enter the ancient musekal sanctuary (for the guests "too long in exile")�the TOWER OF SONG�, you will see what I mean and cry out: "I Understand!" You will join the chorus of "twenty-seven angels / from the great beyond" who sing from one hundred floors above�"Oh, Sweet release!" 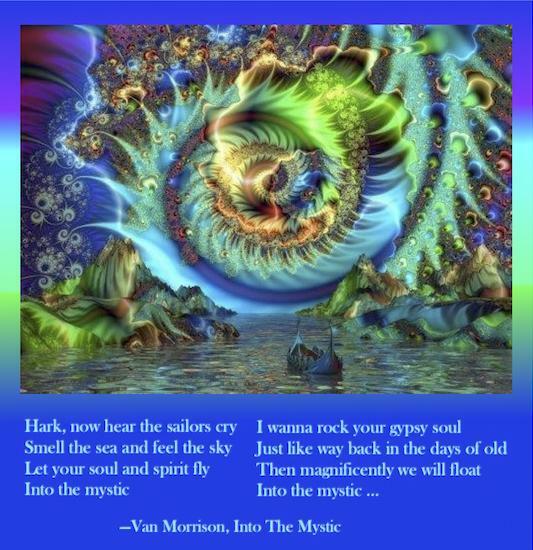 Because Everybody Knows (since the Sixties) about the magical power of music "That�s why I�m telling you in song" �Van Morrison)�the power of Orpheus�, let my Re-Vision Radio Magus of Ceremonies Jester (a.k.a. "Sir Primal Form Magnifico") lead you "down the mystic avenue," where the Angel of Imagination waits to open the magic door into the TOWER OF SONG, wherein dialectics and music�Argument & Song�reign supreme. And Everybody Knows that there's a song hermetically hidden in an essay and, conversely, an essay waiting to be revealed in a song. This means Re-Vision Radio�s essays con-textualize its songs, and, conversely, its songs compose the essay. Thus, the fusion of song and argument is the rhyme and reason for the Orphic Essay-with-Soundtrack. The Orphic Essay - with - Soundtrack functions as that which in the history of Rock 'n' Roll is described as �lyrics that make one think�. guiding its listeners into the Tower of Song. And to find some solace there. You�ll find nothing but a song. And with you it will belong. They will take you where you please. 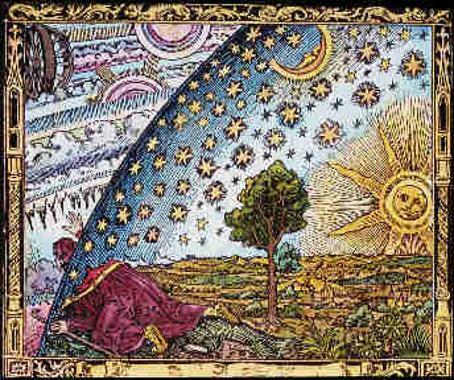 Re-Vision Radio, open to all non-aligned seekers (democratic mysticism), wants you to know what Everybody Gnosis: that it's all about an altered way of seeing things. To discover again that long-lost (Romantic) TOWER OF SONG (and see what it means) in that "Invisible Landscape" of the archetypal Poet-Mystic�s (shaman's) soul�this is our Quest! If you're looking for a different kind of radio experience�the novelty of Radio-text as Soul-text�, tune into Re-Vision Radio's TOWER OF SONG program, hosted by the Gypsy Scholar & Bohemian Essayist. If "in the middle of the night / I go walking in my sleep," and you've "been searching for something / Taken out of my soul / Something I would never lose / Something somebody stole," and you "don't know why I go walking at night / But now I'm tired and I don't want to walk anymore / I hope it doesn't take the rest of my life / Until I find what it is that I've been looking for," then listen up! to Re-Vision Radio, where you may "hear those funny voices" (of the "visiting" Muses), because its co-host, "The Angel of Imagination & Music" (aka, the Angel of Enchantment), may be playing your song; to help you "find what it is that I've been looking for / in the middle of the night"�the TOWER OF SONG. 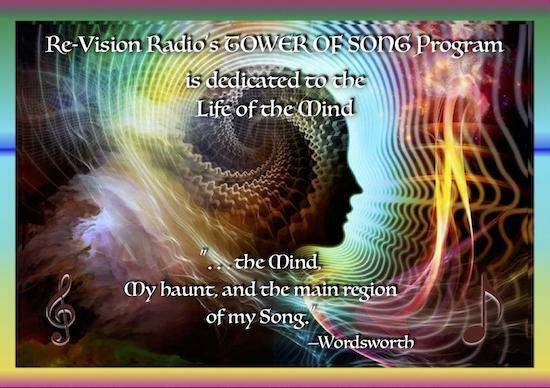 In other words, the purpose of this "Mental Radio" program is to transport/translate you into the TOWER OF SONG. 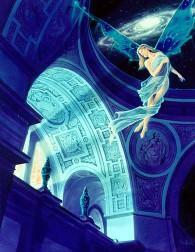 "The Angel of Music visits me at night, in dreams, and sings songs in my head." 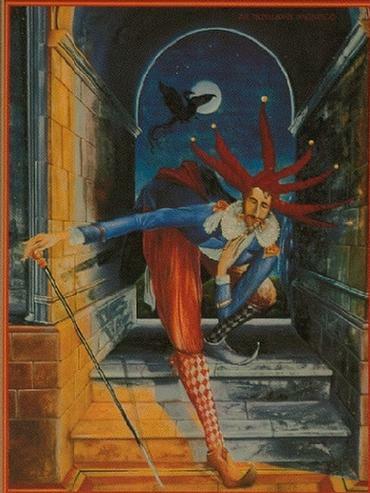 The Gypsy Scholar, as Master of Radio Ceremonies, would, with the aid of the Mercurial "Sir Primal Form Magnifico," take you back--"way, way back"--to the Animistic world view (the Anima Mundi) by way of that magical time in the Midnight, wherein everything came alive and reveled till dawn, when the magic fled the scene to make way for the mundane (solar) or work-a-day world. 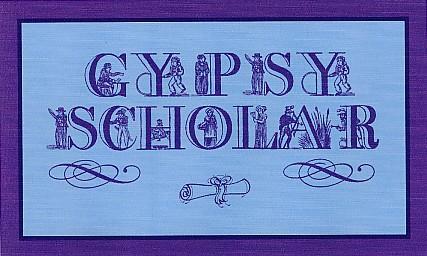 In this, the Gypsy Scholar recognizes the nineteenth-century breakthrough paradigm of the "Romantic Nightworld" and its celebration of Lunar (imaginal) consciousness, as an antidote to excessive masculine ego (solar) consciousness and its cultural repression of the feminine principle, myth, dream, vision, and mystery. Therefore, the Gypsy Scholar follows the archetypal mountain-climbing (ascent and descent) journey of the Romantic poet Wordsworth, whose autobiographical account in The Prelude is read by the Gypsy Scholar as the journey of collective Western consciousness (an "internalized quest-romance"). "I recognise thy glory ...."
Gypsy Scholar & Bohemian Essayist is a radio handle that expresses my ideal of the blue-collar intellectual and public intellectual, who is in "the public role of the intellectual as outsider, 'amateur,' and disturber of the status quo." 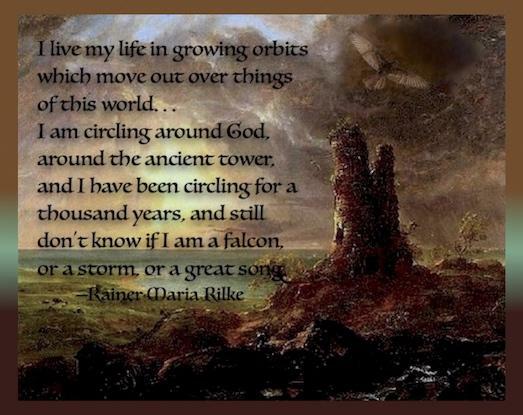 My "amateur" status (the love of learning) as an "intellectual outsider" means that I don't come from the Ivory Tower, but from "that Tower down the track--the Tower of Song." It means a radio program that mixes the elite sensibilities of academia with the common sensibilities of popular music. It means a new "Orphic" scholarship wherein "Intellectual rigor [logic] and Olympian inspiration [mythopoetics] no longer stood opposed.” After what I thought was a novel invention of an epithet (an inversion of the title of the Matthew Arnold poem), I discovered the following from a biography of a radio journalist: "I was what they call in the profession a ‘gypsy scholar’—one of a multitude of excess eggheads who roam from campus to campus, teaching introductory courses like ‘Composition.’ I became practiced at moving into temporary teaching positions and other people’s offices.” My novel idea of the "Gypsy Scholar" also suggests the idea of the scholar-as-artist, meaning I enjoy a mode of scholarship as artistic endeavor, where the modern-day "Gypsy Scholar" is distinguished by the ability to synthesize (through the mode of eros) and "play with knowledge" in order to create “a collage of ideas.” This issues in a mode of popular scholarship--scholarship as performance art ("Mental Studies & Performances" -Blake). Therefore, "Gypsy Scholar" not only means the postmodern outsider intellectual (broadcasting in exile), but also the ancient "Inspired Scholar:"
By the streetlight, by the lamplight . . .
And I'm workin', on the insight . . .
"Now I Step Inside ..."
The host for the program, the Gypsy Scholar, is in exile from the Ivory Tower, and has moved to "that tower down the track"—the TOWER of SONG. 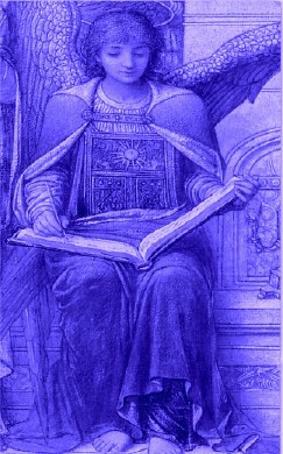 This must be the book, or Archetypal Book (which is, at once, a Cosmic Library), kept by the archangels since the beginning of time. Given all this, "reality" must be what poet Wallace Stevens called "the supreme fiction." Therefore, I became a Gypsy Scholar when I "sealed my fate" and entered through that "magic door" into the Memorial-Musekal Library in the TOWER of SONG. ... a kind of Borgesian library of infinite possibilities." "There was a mystique that surrounded these [underground] stations [and late-night freeform programs]. As if some private, magic door had been found to a new dimension .... I can't remember anybody who didn't love the music and who didn't want to share it with the audience."